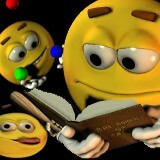 3D Smiley Guys has stylized animations of varied sized "emoticons" set against a solid background. User can tint smilies and change background color. 3D Smiley Guys is a fun 3d screensaver featuring stylized smilies. Loony background music is perfect for these creatures crazy antics. Demo contains full set of features. Have fun customizing this screen saver to your preferences. You may adjust the background tint, separate animation tint, brightness, sound mute and volume control. Giant animated skull with tortured features against a blood red background inside a flaming inferno.